Start the engine and idle it. Select the active test mode on the intelligent tester. 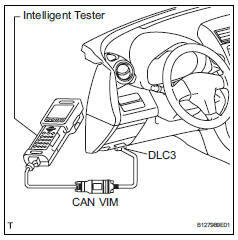 Please refer to the intelligent tester operator's manual for further details. Do not keep a motor relay on for more than 5 seconds. When operating it consecutively, wait 20 seconds between each operation. Turn the motor relay on and check the actuator motor operation noise. Turn the motor relay off. Fully depress the brake pedal and hold it for approximately 15 seconds. Check that the pedal's initial depth is maintained for the entire 15 seconds. Turn the motor relay on and check that the pedal does not pulsate. Turn the motor relay off and release the pedal. Be sure to follow the procedures below when turning on a solenoid. Do not keep a solenoid on for more than 10 seconds. When operating it consecutively, wait 20 seconds between each operation. With the pedal depressed as much as possible, perform the following operations. Turn the sfrh and sfrr solenoids on simultaneously, and check that the pedal cannot be depressed further. Turn the sfrh and sfrr solenoids off simultaneously, and check that the pedal can be depressed further. Turn the motor relay on. Check that the pedal returns to the "depressed as much as possible" position. Use the same procedures described for the front right wheel to check the solenoids of the front left wheel. Use the same procedures described for the front right wheel to check the solenoids of the rear right wheel. Use the same procedures described for the front right wheel to check the solenoids of the rear left wheel. Check and clear the dtc (see page bc-47).